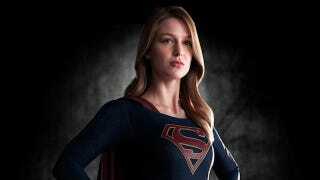 The casting news for CBS' Supergirl TV series have been coming both fast and furiously, but here's the big reveal — the first look at star Melissa Benoist as Kara Zor-El, complete in her Supergirl uniform. And we are shocked to report that... well... she actually looks pretty great! The costume is clean, simple, iconic — sure, the colors are a little darker than her comic counterpart, but that's just par for course in live-action superhero adaptations, DC and Marvel alike. I love how it's also just a straight-up costume, and not some bizarre "Kryptonian armor" or something.